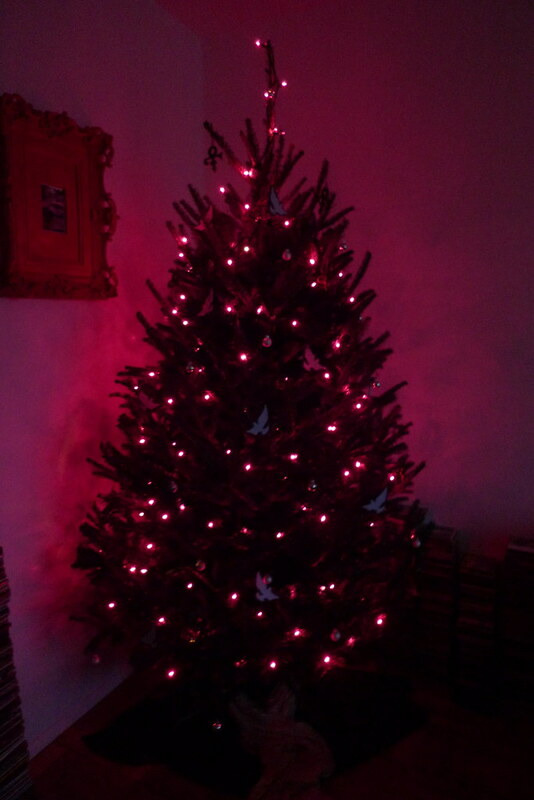 i realized a few weeks ago, for reasons that are difficult to explain but nevertheless terribly logical, that our first christmas tree in our new digs needed to be a prince-themed tree. beyond purple lights (acquired posthaste from the purple store, where folks were predictably enthusiastic about my project), i didn't really know what i'd be using; in an early draft of ornament plans, for instance, i was going to buy little peach glass orbs and wrap them in yellow lace as a tribute to the assless pants of '91. in another, i thought about raspberry berets made of acorn caps (i did end up finding my old hoard of acorn caps, but the idea was still unforgivably twee). i didn't end up using lace at all, which would invalidate the whole tree in some circles - but the wall of lace at mood didn't inspire me, and i ultimately decided to work with something like a 1:9 lauren:prince ratio. this is how the music craft tends to go down; judge me if you must. ornament project #1: fragrant little cinnamon symbols. 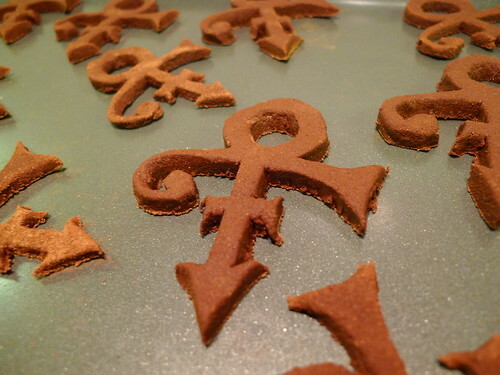 i printed out an image of prince's O(+>, turned it into a stencil, and then made my mom's handy-dandy cinnamon garland dough (ground cinnamon mixed with applesauce). i spent most of sunday afternoon a few weeks ago cutting symbols out of the dough and, most likely, laying the groundwork for a serious dowager's hump (we didn't have our kitchen table yet, so i sort of hunched over the counter). cut out by hand, internet. i was going to make seven because, well, duh, but i wanted to account for breakage, so: twelve. i then baked them for a few hours and left them out to harden up for a week; the apartment's been all spicy-smelling and fancy as a result. 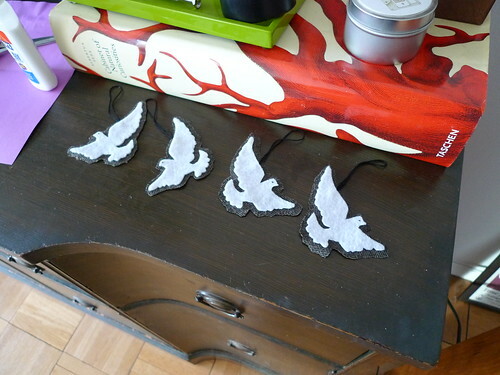 i highly recommend this project, especially if you've already got cookie cutters in your desired shape. 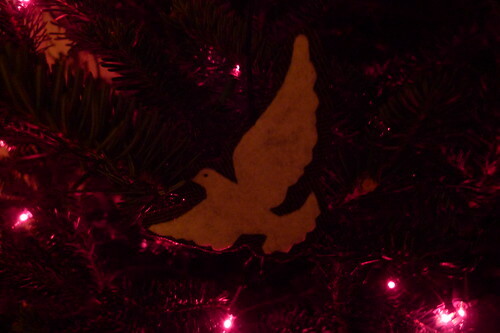 ornament project #2: felt doves. these fellows were trickier to figure out than the symbols had been; in their first incarnation, executed with a glitter pen, they sort of looked like jailhouse tattoos (going for photorealism with something other than decoupage was a terrible, terrible idea). i then went more mod and ended up with a compromise. these fellows are backed with tweed outdoor fabric, which gives them golden backsides. a nod to '91? i made twelve of them as well. i toyed with the idea of a star that looked like the kid's studded purple coat from purple rain, but that was a bit too literal. 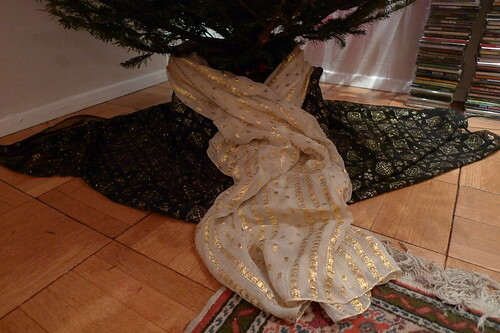 i compromised with tree scarves instead of a tree skirt. 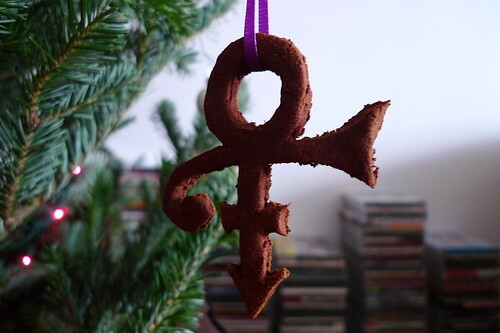 merry princemas 2 all, and 2 all a good night. I'm a little miffed by the lack of lace. I won't lie. OH. EM. GEE. Best thing I ever did see!